What is the difference between Kinetico and other water systems? Kinetico water treatment systems are very different than any other brand on the market today. First and foremost, they are completely non-electric, meaning there are no timers, computer boards, plug-in or electronics, whatsoever. This is beneficial for a couple of reasons. Firstly, electronics are expensive and can be faulty, therefore with a Kinetico system, there are no costly repairs or parts replacements on whatever type of water system you have. Kinetico is completely water driven, using the motion of your water to meter your water usage and regenerate only when necessary. An electronic system works on a clock, regenerating at a set time, even if you’re not home or not using water—resulting in additional water and salt waste. Secondly, Kinetico softeners have a dual tank design to give you treated water 24/7. When one tank needs to generate, the valve head switches tanks and regenerates the used one, while providing your home with treated water from the second tank. This twin tank design also enables us to use treated water for regeneration and the valve head never sees untreated water, both extending the life of your system and protecting itself from hard water or iron build up. Do you work outside of Grande Prairie city limits? Yes! Silvertip will travel pretty much anywhere for plumbing and water treatment needs. We regularly visit clients in Bezanson, Debolt, Sexsmith, Rycroft, Wembley, Beaverlodge, Grovedale and many more places! Please call the office at 780-876-4618 for travel rates to further destinations. Our office is located at unit 101, 15902 - 102 Street on the north end of Grande Prairie behind the UFA farm store. We moved in to this location in October 2017 and love having a front office area to showcase our water treatment systems and plumbing products. Do you offer after hours emergency calls? Our regular hours of operation are 8am to 5pm, Monday to Friday, however our office lines are always forwarded to a plumber after hours and on weekends. What credentials do your system installers have? Our water treatment specialists have been extensively trained at Kinetico’s factory in the United States and have become certified in sales and service. They also have been trained in Canada with several other water treatment manufacturers to provide repairs and service to non-Kinetico systems. In addition, they are also ticketed journeyman plumbers to ensure all your installations are up to plumbing code with the proper fittings and water pipes. For plumbing and/or heating repairs and new installations, we have several certified journeyman plumbers with decades of experience so your job is always done right! Our plumbers also have continuous training by manufacturer reps for boilers, hot water tanks, and more to keep up with the everchanging products and technology within the plumbing industry. How much does a Kinetico system cost? 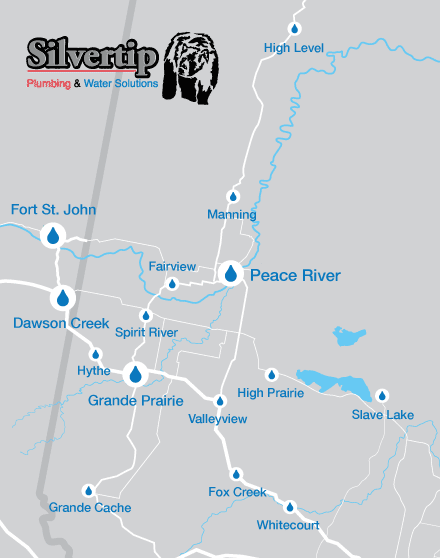 Depending on your water type and quality, Silvertip carries a wide range of water treatment systems for your home or business. Whether you’re looking for a small drinking water system, a home water softener, an iron filter, or some other water need, we have the system for you. Please call to schedule a free in-home demonstration where we can review with all the options with you. What is the warranty Silvertip offers for new installations? For all new installations, Silvertip offers a one-year warranty on parts and labour. After this you have the manufacturer’s warranty which varies depending on the product. Plumbing products such as hot water tanks, unit heaters, faucets and toilets, for example, will all differ and can be found by calling the manufacturer directly or contacting Silvertip. Kinetico water treatment systems generally have warranties between 5 and 10 years, however this depends on the specific system. We can provide you with a warranty sheet that will explain in detail the warranty you have with your system. Your warranty is transferrable to a new owner if you decide to sell it with your home or to someone else. As well, Silvertip can easily uninstall your water system and it can go wherever you go. What are the effects of chlorine in our water? Chlorine is necessary in municipal water supplies because it ensures any bacteria or harmful contaminants are removed from the water. However, once the water is inside your home it is no longer necessary. Chlorine dries out your skin, leaves your hair brittle, fades your clothing during washing and effects the taste and odour of your water. How much salt is added to my water from a water softener? All water softeners work by the process of ion exchange; every ion of hard water mineral (calcium and magnesium) is exchanged with an ion of sodium. The sodium ions are taken from the brine drum which is connected to the softener and where your salt is stored. The level of sodium added to your water varies depending on the hardness level of the water. However, the sodium levels are extremely minimal in comparison to other foods we regularly eat. For example, Grande Prairie city water, which is 12.5 grains per gallon hard, 1 grain per gallon of hardness removed would add approximately 7.9mg/L of sodium ions. To compare that in everyday life, one tablespoon of Heinz ketchup contains 140 mg of sodium! That is 18 TIMES the amount of sodium in 1 litre of water! Where can I purchase filters, parts and solutions for my water system? As your local Kinetico dealer, Silvertip stocks all required filters, salt and solutions for your Kinetico softeners, reverse osmosis systems and iron filters, as well as needs for other Kinetico systems. We also carry a variety of products for non-Kinetico systems you may have purchased elsewhere.